Providing Home Health Care Services in Cook County for over 30 years. Homewatch CareGivers Northshore is a professional home care agency dedicated to providing comprehensive in-home care services, senior and elder care services, Alzheimer’s & dementia care, as well as home health care services to Cook County IL residents for over 30 years. We are available 24 hours a day, 7 days per week and can provide dependable home health care services tailored to meet your individual needs. “This letter is to recommend Mary Jean, who has been a caregiver for my wife for approximately 5 months. Through no fault of her own, we are no longer able to retain her in our employ and recommend her with the utmost certainty that she is and will be excellent and caring caregivers. “You are a very good agency. Pleased with your continued interest in our loved ones. Our caregiver is most Creative. Takes my husband to different places. Weather permitting, parks, Botanical gardens, Garfield Park conservatory planetarium, etc. on some cold rainy days to the malls to just walk. I am writing you today to tell you how pleased I am with the care my mother is getting from her caregivers Annette and Shirley…I have found them to be conscientious, helpful, and consistent in their work…They both have shown initiative, and have gone above and beyond in caring for my mother…I appreciate all the work everyone at Homewatch has had to go through to get this team in place. Thank you for your kindness. People like you make the world a nicer place in which to live. Your generosity made a tremendous difference in the quality of our sister’s final months. Thank you from the bottom of our hearts! I wanted to thank you again for your help and kindness during my family’s time of need. My dad’s life is a little more comfortable being able to remain in his house. You really are a friend. I am very grateful. I am a veteran of World War II, being most fortunate to have Kent O’Grady fill my needs of a caregiver. He is reliable and responsible. Thank you for your cooperation in for the excellent assistance of Kent. 2011 brought a new challenge into Papa’s life. He was diagnosed with cancer. He breezed through 39 rounds of radiation treatments. We all thought he had defeated cancer. But, just after Christmas of 2012 the cancer returned…June of 2013 he returned to his apartment from the rehab center with an amazing man named Resti. Resti would be his caregiver four days a week, 24/7. Ben was his other caregiver the remaining three days. Ben had been studying for his paramedic exam and passed in them in the fall of 2014. Then, a wonderful man named Pius took Ben’s place. These three wise men gave my grandfather their time, care, love, devotion, and sometimes wisdom to my grandfather even though sometimes he could be a stubborn Scottsman. His wish was to live and die in his apartment with dignity and these men made that possible. Resti, Ben, and Pius allowed my grandfather to live a longer, happier, and fuller life. Our family considers them a blessing. At Homewatch CareGivers Northshore we strive to maintain our clients’ independence, dignity, and self-esteem, while supplying them with support and care they need. With more than 30-years of in-home care experience, our compassionate team of in-home caregivers is ready to ensure your continued safety and security at home. Our highly competent and professionally trained in-home professionals undergo extensive interviews, background checks, proficiency testing and skill validation prior to becoming a member of our team of caregivers. They are managed, supervised, insured and meet all State of Illinois requirements for certification and licensure. At Homewatch CareGivers Northshore we specialize in providing you with the Best Home Care Professionals in Cook County. 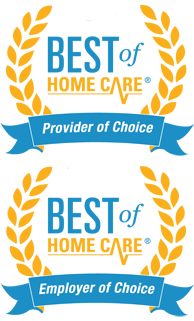 You will have many options when it comes to choosing an in-home health care provider in Cook County. Whether you are searching for personal care services, assistance with physical therapy, in-home care for an elderly loved one, Alzheimer’s or dementia care, or require 24 hour in-home care, Homewatch CareGivers Northshore will work with you to determine which type of home care service is the most beneficial for you’re your particular situation. Homewatch Caregivers employs a wide range of qualified in-home care professionals, including, companions and caregivers, home health aides, certified nursing assistants (CNA), licensed practical nurses (LPN) and registered nurses (RN). In addition to our compassionate team of caregivers, our Homewatch services team can assist you in obtaining durable medical equipment such as walkers, wheelchairs, or a Hoyer lift if needed. Homewatch CareGivers has been providing Alzheimer’s and dementia care to families for 30 years. Our compassionate and certified dementia care team serving the Cook County IL understands that caring for a family member with memory impairment is stressful, and having a neutral caregiver from outside your family can help ease the emotional burden that comes with caring for a loved one. The Alzheimer’s and Dementia home care services offered through Homewatch CareGivers Northshore integrates companion care and personal care, in a comprehensive, individualized plan designed to meet your specific care needs, address specific cognitive deficiencies, and help family members cope with the challenges associated with care. When someone is experiencing health issues they often need extra help with the daily tasks that keep them comfortable in their living environment. When you’re not feeling your best, activities that used to be easy such as taking a bath, or making a health meal, become more difficult. Struggling alone with these activities of daily living can be stressful and can increase the risk of accidents. Homewatch CareGivers Northshore is there to provide your loved one with needed home care services to keep them safe and independent. We work closely with heath care providers who are treating your loved one to provide a seamless home care experience. Our highest priority is your peace of mind about the quality of care your loved one is receiving; this is only accomplished by hiring outstanding caregivers. We invest in rigorous screening before we hire our caregiver employees. We take care of all the paperwork and require ongoing training to keep your caregivers up-to-date and the best in the business. Through our Quality Assurance process, we continuously assess that the caregiver’s personality and skill level are a good fit with your loved one. The first step to finding the Best Cook County Home Care agency is to determine the level of care that is needed. 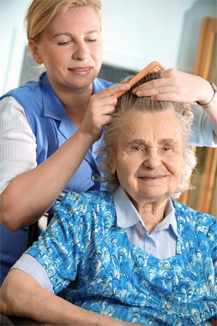 There are two main categories of In Home Care services: skilled care and custodial care. Skilled Care generally provides for specific medical needs while Custodial Care may include Occupational or Environmental Assistance which includes help with housekeeping, shopping, meal preparation, etc. or Personal Care, such as bathing, dressing and feeding. To learn more about the comprehensive in-home care services, senior and elder care services, Alzheimer’s & dementia care, as well as home health care services we provide to Cook County IL residents and to see what level of care you or your loved one may need please contact us at (847) 616-5600 or CLICK HERE to schedule a FREE – NO OBLIGATION HOME CARE ASSESMENT. Homewatch CareGiver’s offers a special “Pathways to Memory” care program for dementia patients and their families. A research study in 2006 found that dementia patients lived longer when their families delayed putting them in nursing homes. Discover tips that will help you care for a family member with dementia. Learn to spot the differences between dementia and Alzheimer’s. Evaluate the progression of dementia or Alzheimer’s at the Memory Clinic, operated by the Rush University Medical Center. The Alzheimer’s Family Care Center (AFCC) is an adult day center on the Northwest Side of Chicago for people with dementia operated by the Rush University Medical Center. Chicago has a number of senior centers located throughout the city. The Latino Alzheimer’s & Memory Disorders Alliance offers family member caregiver education programs in Chicago. Chicagoland Methodist Senior Services offers a Dementia Support and Resource Group on the first Wednesday of every month. The Chicago Department of Family and Support Services co-hosts monthly caregiving support groups at regional centers throughout the city. The University of Chicago Medical Center offers an Alzheimer’s Support Group for families and caregivers on the first Thursday of every month. Chicagoland Methodist Senior Services offers an Alzheimer’s Association Caregiver Support Group on the third Friday of every month. The Alzheimer’s Association website offers a wealth of information and resources related to Alzheimer’s disease. The Alzheimer’s Poetry Project is based on the idea of reading childhood poems to Alzheimer’s patients in order to spark memories and encourage creativity. Find an Alzheimer’s support group through the Alzheimer’s Association. The Home Care Spot is a professional home care agency dedicated to providing comprehensive in-home care services, senior and elder care services, Alzheimer’s & dementia care, as well as home health care services to Chicago area residents, including Cook County, Lake County and the North Shore suburbs. We are backed with the resources of one of America’s largest and most trusted home care service organizations. © Copyright The Home Care Spot. All Rights Reserved.